2.Moore G, Audrey S, Barker M, et al. Process evaluation of complex interventions. London: Medical Research Council Population Health Science Research Network 2014. 5.Dahler-Larsen P. Vejledning om at evaluere innovative tiltag. København: Center for Offentlig Innovation 2016. 7.Bates DW, Zimlichman E. Finding patients before they crash: the next major opportunity to improve patient safety. BMJ Qual Saf 2014. 8.Wears RL. Improvement and evaluation. BMJ Qual Saf 2015;24(2):92-94. 9.Dixon-Woods M, Martin GP. 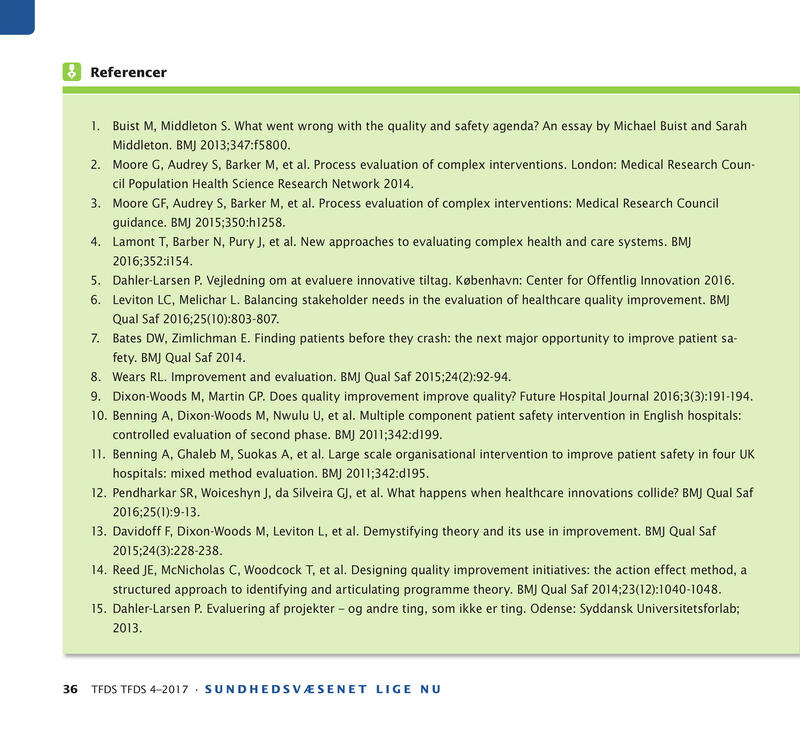 Does quality improvement improve quality? Future Hospital Journal 2016;3(3):191-194.
controlled evaluation of second phase. BMJ 2011;342:d199. hospitals: mixed method evaluation. BMJ 2011;342:d195. structured approach to identifying and articulating programme theory. BMJ Qual Saf 2014;23(12):1040-1048.